Homepage. 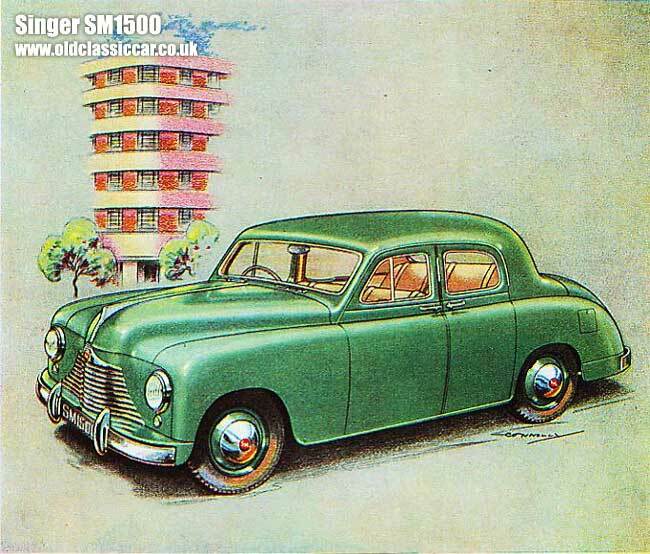 This page: Nice early art featuring the late 1940s Singer SM1500, forerunner to the revised Hunter model of 1954. The SM1500 was not a create success, and was a pale shadow in terms of popularity when compared to earlier Singers. This mid-size saloon was introduced shortly after the war, in October 1948, but didn't catch on. Sales continued to 1956, by which time Singer dealers were having a great deal of difficulty in shifting their stock. It was powered by the overhead cam four cylinder engine also found under the bonnet of the Singer Roadster, an open-top model that met with more buyer approval than its slow-selling 4 door brother. I'm not sure where this advertisement was originally published, as it was scanned and sent in by Les, along with other items of motoring interest. The SM1500 was unusual, even its day, for still persevering with suicide doors at the rear. The idea behind the rear hinged doors was that it made clambering into the rear seats an easier operation than with the usual hinge arrangements. There may well be some truth in this, but by the mid 50s it was not a terribly fashionable feature in contemporary car design. The conservative styling of the entire car was less-than-earthshattering, even for postwar Britain, a country already used to fairly dreary automotive designs and colours as the country sought to pick itself up after WW2. Survivors are very thin on the ground - partly because not that many were made, especially if compared with the output from BMC and Ford. Later Singers would be re-worked Rootes Group products, carving for themselves a niche as producers of smart and well fitted-out cars, while sharing many components with more humdrum Hillmans of the day. If you own one of the few surviving SM1500s, you can post free parts wanted or for sale adverts on oldclassiccar - visit the SM1500 free ads page for details on how to place an ad. A period photo from the 1950s, showing a SM1500 saloon parked at the roadside, can be seen here.